There are different ways to achieve such a TOG. Some variants include the possibility to combine comforters of different TOG together to form a much warmer one for tough winters, while other comforter types focus primarily on the type of filling they have. Whichever approach you prefer, make sure that your comforter will have the necessary TOG to keep you warm and cuddled in the cold winter nights. When it comes to picking the right comforter for you, the type of filling that it’s composed of can be the heart of the matter. We’re often led astray by other features and realize only later the quality of the filling is nothing else than a deal breaker. Such fillings borrow from the evolutionary brilliance of nature. Adapted to retain as much heat as possible, such a filling is generally a good choice. 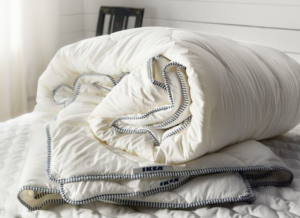 When a comforter has a greater ratio of down than feather, it will naturally feel lighter. Down are particularly designed to entrap heat. So don’t get mislead by the weight of the comforter, for that is only one of the aspects of its thermal efficiency. Wool is another very smart material nature came up with. It not only does a great job at retaining heat, but it also has other useful properties such as being hypoallergenic and normalizing moisture in the air. It is also soft, comfortable and a preferred choice for many. The fiber of silk is stronger than a fiber of steel. While that might seem impressive, silk is also extremely comfortable and soft. One of the biggest trade routes in history has been named after this material, after all. As such, it’s quite a delicacy but it’s also quite thermally efficient and keeps your body temperature very constant, avoiding overheating or the cold. This is a synthetic material produced by technology. But it doesn’t mean it falls short of efficiency and comfort. Microfibers tend to be very docile and soft and can easily be mistaken for other materials. Another important factor you should consider before settling for the ideal comforter this winter is weight. Some people prefer the light feeling a down comforter gives. They enjoy keeping warm without being tucked in too much. Others really enjoy a proper cuddle with a heavy comforter. This is largely a matter of personal taste but is nonetheless important to consider before settling for your choice. A good night’s sleep can increase our effectiveness and general mood during the day and there’s no better way to assure that than to pick a suitable comforter for the upcoming winter. By keeping warm at night you also don’t spend hefty amounts of money towards your energy bill. In this sense, a comfortable, effective comforter is a true and proper investment. Before finalizing the deal, don’t forget to look at the cleaning instructions that come along with the product. Due to the huge variety of possible combinations some require more effort and attention than others when it comes to cleaning, washing and maintenance.